Carved Wood Big Number Address Plaque - - personalized pine wood address sign perfect for cabins, RV parks, and country homes. Wall mount. Made in USA. 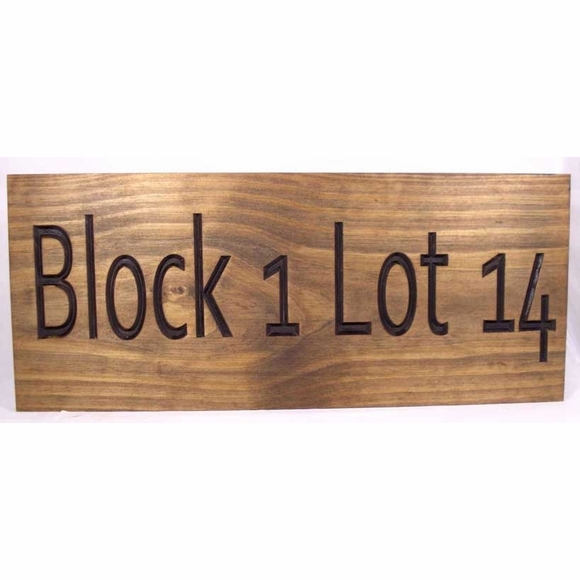 One line address sign displays your address in crisp large letters. Customized with the address you specify and edge style you select. NOTE: In addition to the address format shown in the sample, your personalization can be a standard address (e.g., 1422 Third Ave. on a 22x9 sign) or name (e.g., Comfort House). Solid pine construction. Carved personalization. 18x7 sign holds up to thirteen (13) 3.5" characters. 22x9 sign holds up to fifteen (15) 4.75" characters. 24x11 sign holds up to seventeen (17) 5.5" characters. Please make sure to order the correct sign size for your personalization. (NOTE: you do not have to fill the entire input box.) Leave the two unused input boxes empty. Finish: medium brown stained. Sealed with a clear-coat marine finish. The finish takes on a "wood burned" look as the wood grain absorbs the stains differently.